At 33 metres in length Snefro Spirit is a twin engine, luxury liveaboard designed to meet all diver's needs. Built in Alexandria in 2008 and with yearly renewal, she comfortably accommodates up to 18 guests in 8 twin berth cabins and a master suite on the upper deck. All cabins are comfortably furnished, air-conditioned with en-suite bathrooms, mini-bar, safe storage and central music system. All cabins have a 220V power socket - ideal for charging cameras, strobes, torches or your mobile phone. The spacious restaurant and salon area are air-conditioned and lavishly furnished, with plush sofas and polished wood flooring. Modern entertainment equipment with a large flat screen TV with DVD/CD player - ideal for reviewing the days photographs & video or just watching a DVD in the evening, games, books and magazines are also available. For those that can't get enough sunshine there 3 large sun decks (2 with a bar), partly shaded or open to the elements, lovely places for relaxing in-between dives or in the evening. Snefro Spirit has a few added luxuries onboard, including an onboard sauna for non diving guest. WIFI is available free of charge (relies on mobile network coverage). Three main meals with a varied menu throughout your trip are served in a buffet format. There is something for everyone including vegetarian meals. Sweet and salty snacks, soft drinks, tea/coffee and water are always available throughout the day. The large dive deck is equipped with two fresh-water showers, two bathrooms and is designed to provide space for kitting up. 2 Bauer compressors and the Nitrox compressor are located below deck and silent during operation. Nitrox is free of charge for divers holding Nitrox certification. Air quality checks are regularly carried out and fillings are conform to EN12021:1998 standards. 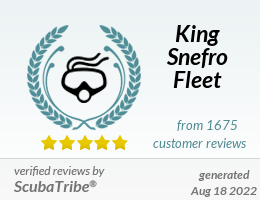 Snefro Spirit is holding ISO Certification for Recreational Diving Service Providers (EUF: S 000060 till 30.06.2016), is member of Chamber of Diving and Watersports (CDWS: SSSB 0039 S) and departs from Sharm El Sheikh (New Marina, El Wataneya) on all Mini Safaris, Sinai Classic, Sinai Wreck & Reef and Deep North Marine Park routes. Engine 2 x 520 HP G.M.